The province is consolidating Edmonton’s diagnostic labs into a new publicly governed facility that will address the region’s growing need for lab services. 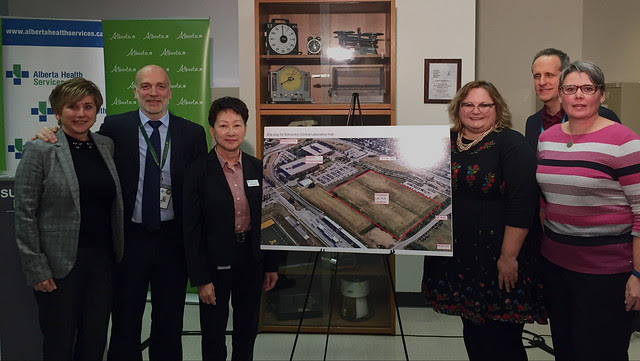 Health Minister Sarah Hoffman and Dr. Verna Yiu, President & CEO of AHS unveil the location of the new Edmonton lab hub facility. Planning is underway on the new Edmonton lab hub, which will bring several clinical labs together on 5.8 hectares of provincially owned land near the University of Alberta’s south campus. The change will affect where the results are processed – not where Albertans get their lab tests done. The new centre will lead to greater integration, capacity and efficiency of diagnostic services. Because of its central location and proximity to the university, the site will foster research while supporting patient care in Edmonton and northern Alberta. The Mayo Clinic, a non-profit medical research institution in Minnesota, has provided preliminary advice on design and programming. A subsequent HQCA report provided more detailed recommendations on lab governance following an extensive review of national and international jurisdictions, scientific literature and engagement with stakeholders. Tags: clinical labs Alberta, Edmonton lab hub, lab services Alberta, Minister Sandra Jansen, Minister Sarah Hoffman. Bookmark the permalink.